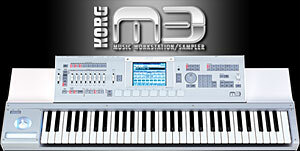 All pages that relate specifically to working with Korg M3 workstations are listed here. Be sure to also look through the KARMA 2 (for OASYS and M3) articles, because most KARMA-specific tasks are listed in that category. You may also click on the korg-m3 tag in the Tag Cloud to find all articles that have been tagged with korg-m3 that may not be directly contained in this category. To create a new page in this category, click Add new Korg M3 page in the side menu (after entering a title in the box).